Are your kids “coocoo for Cocoa Puffs?” Does there breakfast come in the form of pink moons, yellow stars, and orange clovers? Are they receiving morning nutrition information from a rabbit? Silly parent! Trix are for kids! Unfortunately now, so is obesity, heart disease, and diabetes. Foods and drinks high in sugar are at the “heart” of the problem, no pun intended. Unless your child is independently wealthy and has the means to drive to the store to purchase food, you are the nutritional gatekeeper. It’s not an easy job, but it’s an important one. The last significant societal decrease in physical activity was around the years of the proliferation of the television (the 60’s). Since then, we have probably decreased our overall activity, but nothing considered statistically significant. Despite no significant decrease in activity, we have seen a consistent increase in obesity. Our bodyweight and bodyfat are regulated by the amount of energy we expend vs. how much we take in. If we are not expending any more or less energy than we used to, we must be taking more in. Even worse, in attempt to multiply our food supply, keep food costs down, and keep big food company profits up, there is less “food” in what we eat. At the end of the day, we are consuming mostly flavorings, colorings, and preservatives with a little bit of wheat, corn, or potato product. Does this sound like something that is good for us? If this food was prepared in front of us and not behind well-protected doors at food production plants, would it still be appetizing? Why do we eat it then? The answer? We are addicts that learned at a young age that this is an acceptable form of “food”. Our “taste” for food is formed at a young age. If high doses of sugar represent “breakfast” when you’re a kid, that’s probably what it will represent when you’re an adult. The same goes for a high salt, high fat food representing “lunch”, “dinner”, or “snack”. The tastes in these high sugar, salt, and fat foods aren’t even real tastes. They are enhanced so that we will have a more significant taste experience, making us want to buy the product again. If you grow up on this type of food and then have something homemade with whole food products, it doesn’t have the perfect uniform consistency and taste. It doesn’t taste like “food” to you. You eventually go to the doctor and receive your certain death sentence if you don’t change your diet. Now you must re-train yourself as to what food actually “tastes” like. Due to the high emotional significance related to food and taste, this becomes a daunting battle for your health, and consequently, your life. There is absolutely nothing wrong with letting a child have a processed, sugary, fatty, salty treat every once in a while. The most important intervention with kids however, is to have this regulated by the parent. Kids can’t make long-term, rational decisions about their health. Of course a sweet chemical taste is going to seem like a better choice to them. If you fill their breakfast bowl with sugar cereal, their lunchbox with processed lunch items, and their belly with fast food for dinner every day, what are you teaching them? It’s your job as a parent to teach them that it’s OK to eat that stuff every once in a while, but it’s not actually “food”. Food is what mom or dad prepares from a recipe and serves at the dinner table. Try to eat “food” at meals 90% of the time. Real food can be delicious. Involve your kids in the process. Take them to the grocery store, especially if it’s a more “adventurous” one like Whole Foods. Let them pick out some crazy looking fruit or vegetable to try. The vivid colors and shapes of most fruits or vegetables are actually appealing to kids if they are properly exposed to them. Show them real food and get them to have an appreciation for it. Maybe even take them to a garden or involve them in growing a small garden at home. Spend time when they’re young showing them how to make real food. Not only do they learn the basics of cooking, they learn that real food is created, not bought in a box. Finally, when mom and dad complain that real food is “health food,” kids relate “health food” to “tasteless”. Create a culture of health in the home. In today’s busy home and work environment, taking extra time to instill better nutrition habits is a challenge. However, it’s a challenge we must accept. The alternative is far more inconvenient. If we continue with our current trend of obesity, our kids that are 5 right now will inherit a trillion dollar health care expense specifically dedicated to obesity related maladies by the time they’re 25. That’s not to mention the personal impact of poor health. Create a “taste” for health at a young age to create a future of happy, healthy, pain free adults. Brett Klika C.S.C.S., Director of Athletics at Fitness Quest 10, is a human performance specialist, motivator and educator. A graduate from Oregon State University, Brett has directed sport camps all over the nation. While in college, amidst playing club soccer and lacrosse, Brett worked with the strength and conditioning department for 3 years. A year long resident sports performance internship at the Olympic Training Center brought Brett to San Diego. Brett’s work with the Olympic athletes, as well as local high school athletes nurtured a passion for creating excellence in individuals. Hey everyone! I hope you guys are having a good week. Big shout out to all the fathers out there! One of our coaches, Coach Jeff, just celebrated his first father’s day as a father! I wish you and your family the best. I also just want to take a second to thank my dad. I wouldn’t be here in this position without my dad, so I just want to say I love you, Dad and you are the world’s best dad! Ok, now that I’ve got out all the shout outs it is time to talk about the camps. I’ll be writing a weekly blog about the summer camps happening here at Fitness Quest 10. This week I’ll be writing about the Quest 10 kids summer camp. The Quest 10 kids camp was the first of our summer camps to get started, starting on June 15 and going for four weeks. Camps start at 8:30 a.m. and last an hour. The Quest 10 camp uses both the upstairs and down stairs facilities, as well as the park on Fridays. The constant change of scenery for the kids is great because they don’t get comfortable with just one place. I know kids get bored a little faster than adults, so this process keeps them excited. 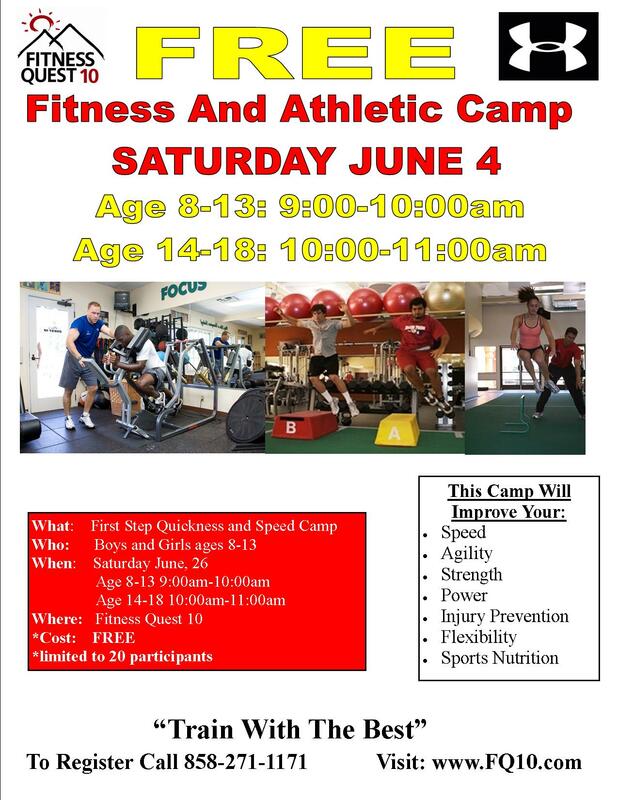 This is the only camp that goes by this protocol…all other camps use the downstairs facility. Personally, I think the park is a great tool because it shows the kids that they can get a great workout with just a field. We bring some equipment down to the park, such as ropes, ladders and hurdles, but with or without the equipment the kids can still get effective work done. We have eight stations at every facility. On Mondays and Wednesdays, we use the workout and plyometric equipment. We partner the kids up and they go through an eight-exercise circuit. Each intern is responsible for one station. Interns are instructed to teach the kids the proper technique in the beginning, but after that we just want the kids moving, whether it’s slamming dynamax balls or performing TRX rows. Fridays are the only days we have some type of game for the kids. Last week we played “Simon says.” Everyone had a lot of fun with that came, and I actually was the first person out! We have some great athletes in this camp and I can’t wait to see all the progress that they make. One of the kids did over a 100 jump ropes in 60 seconds and two kids did over 50 “real push-ups” in 30 seconds. These kids are amazing! They always come with a smile on their face and it gets all of us as coaches really excited. For those days that some of the kids aren’t as excited, it’s our jobs as coaches to get them excited and focused for the one hour they are with us at the camp. We give them small challenges to keep them interested and the competition aspect really excites them. I’m constantly timing them or keeping a tally on their reps and telling them to try to beat their own score. They love to see their own progress just as much as I like to see it. Anyway, I could talk all day about this great group of kids so I’ll end it here. Have a great weekend everybody! I look forward to all that these camps have in store for me and for the kids! One of the most common questions I get as an athletic performance coach is “How can I/my child, improve my/their vertical jump?” The most effective intervention would be to travel back in time and select a man and a woman with superior vertical jump abilities to parent either you or your child. In short, genetics is by far the greatest determining factor in an individual’s vertical jump ability. Since time travel is not currently available (to the general public) we have to work with what we’ve got. Here are the 3 most effective tried and true ways to improve vertical jump. 1. Improve strength-to-weight ratio. The vertical jump involves culminating muscle force quickly to propel body weight off the ground against gravity. If the muscle force ability is low and the body weight is high, gravity will win. Proper nutrition, frequent activity, and developmentally appropriate resistance training will aid improving strength and decreasing excess weight. Get stronger, get leaner. 2. Work on jumping technique. There are biomechanically advantageous positions in which to jump as well as land. Proper arm action alone can account for 20% of vertical jump ability. Quite often, there are strength and mobility limitations that can limit the body’s ability to go into biomechanically advantageous position to jump. For example a proper bodyweight squat is a pre-requisite to vertical jump technique. If you don’t have the strength or mobility to do the first one right, you won’t be able to do the second one right. Work on jumping and landing in proper squat position, then progress from there. Click here for a video on vertical jump technique. Do it right to do it better. 3. Jump! Make sure to incorporate plyometrics into your program. Think of your plyometric training in two phases: Plyo prep and max effort plyometrics. Plyo prep is activities like jumping rope, hurdle hops, and repeated sub-maximal jumps, hops, skips, etc. These function to prepare the involved tendons, ligaments, and muscles for the force demands of jumping and landing. These activities help you get off the ground quicker, not necessarily higher. Max-effort plyometrics are those that require a near-maximal effort to achieve. High hurdle hops, high box jumps, high backboard touches and other jumping activities in which you have to achieve a certain height criteria are examples. You may even add resistance through bands, cords, or external weight. This functions as “practice” for propelling your body against gravity with a true maximum effort. Maintain technique. Practice makes perfect! Youth should perform plyo prep activities for quite some time with proper technique prior to max effort work. There is no “magic” machine, device, program, or funny-looking shoe that supersedes any of the above. Get in shape, jump correctly, and practice it with intensity and frequency. Unless, of course, you have access to a time machine. Everyone has an opinion when it comes to nutrition. What you should be eating, what you should avoid, how many meals you should be eating, whatever. But when it comes to the 10 Commandments, there is no room for discussion. You can follow whomever’s advice when it comes to what you should be eating and when, but you need to follow these commandments if you want to get serious about your nutrition. # 1: Get your motor started. Eat breakfast. Breakfast is the most important meal of the day. When you wake up your body is in a fasting state for approximately 7 to 9 hours. You wouldn’t eat from 9:00am until 5:00pm would you? #2 : Slow down! We are always in a hurry. When you apply that to food, too many people are shoveling in too much food way too fast. It takes the brain 20 minutes to process how much you have eaten, and when you make your food vanish, your brain doesn’t have time to cut you off and you consume far more food then you need. #3: Fuel up before training. A high quality workout doesn’t begin with your dynamic warm-up. The process starts with your pre-workout meal. This is the first step to getting your body right so it can perform at optimal levels. #4: Refuel after training. Your body isn’t built in the gym. You actually break muscles down during a workout. Afterward, muscles become sponge like and want to soak up nutrients so they can rebuild themselves strong and leaner while you rest. #5: Go wild! Our ancestors had the right idea: fresh food is better. I’ve never seen an obese person who got fat because they ate too much fruit, salad, and fish. Eat fresh and wild and you will be eating better! #6: Remember that supplements are just that – supplements! A lot of people are looking for a magic pill to change their bodies. Sorry, folks, the world doesn’t work like that. #7: Water your body. Out bodies are about 70% water, meaning we need to hydrate as often as possible. In other words, drink more water. About half your body weight in fluid ounces daily is the easy rule to follow. #8: Keep a nutrition journal. Research shows that we lie to ourselves. A nutrition journal can be crucial to improve your life. You will find out that you will be in more control of what you eat and start to become accountable to you. #9: Follow the 90-10 Rule. If you eat the right foods 90% of the time, you are going to be world class and achieve your goals. The other 10% allow yourself to sample foods you love, just don’t get out of control. #10: Experiment with the IMPACT menu. The IMPACT nutrition menu is a no stress approach what allows you to experiment and enjoy a variety of foods from carbs, proteins, and fasts. I promise you you’ll never eat better. Todd Durkin, MA, CSCS, is an internationally recognized performance coach, personal trainer and massage therapist who motivates, educates and inspires people worldwide. He is the owner of Fitness Quest 10 in San Diego, CA, where his wonderful team of 35 focuses on personal training, massage therapy, Pilates, yoga, sports performance training and nutrition to help transform the bodies, minds and spirits of a broad clientele. Todd trains dozens of NFL and MLB athletes, including 2010 Super Bowl XLIV Champion and MVP Drew Brees. He is the head of the Under Armour Performance Training Council, serves on the Gatorade G-Fit Team, and is a featured presenter on the Perform Better educational circuit. He is a two-time Trainer of the Year (IDEA & ACE). Additionally, Todd provides motivational talks and programs to companies and conferences worldwide. His new book, The IMPACT! Body Plan debuted in September 2010 and is a 10 Week program designed to create world-class fitness and life performance. You can sign up for Todd’s FREE award-winning Ezine newsletter, the TD TIMES, at www.FitnessQuest10.com or www.ToddDurkin.com.